Michael Wang arrived in a big way tonight, on poker’s biggest stage, against the toughest competition. The 26-year-old poker pro from Livingston, NJ collected his first World Series of Poker gold bracelet, an accomplishment made even more impressive by the intensity of play throughout the tournament, a huge comeback when he was battling heads-up, all culminating at the end of a long six-year journey to reach this personal poker pinnacle. 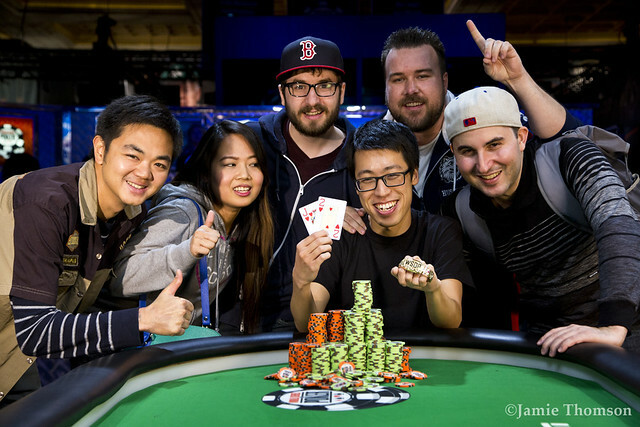 Wang won what was the first event open to all players at the 2015 series, collecting $466,120 in prize money. Moreover, he now enjoys bragging rights for conquering what’s expected to be one of the toughest fields of the entire year. This achievement comes after grinding out cash game profits for years, mixed with an occasional WSOP Circuit event. However, until this point, Wang had not done anything close to this in terms of self-satisfaction. Following the grand opening held at the Rio in Las Vegas, which was the traditional Casino Employees Championship, Event #2 brought together quite a different lineup consisting of 422 of the world’s top No-Limit Hold’em specialists. Indeed, this was a $5,000 buy-in marques competition that produced a stellar lineup anticipated to be stacked with well-known professionals, many with considerable WSOP past glory attached to their resumes. Such expectations were met, and then some. The tournament lasted three full days and ended late on a Friday night on the ESPN Main Stage with a packed gallery of spectators. The final table included three gold bracelet winners, including Greg Merson (Laurel, MD), a three-time champion best known for winning the 2012 WSOP Main Event. Had Merson won instead, this would have marked his fourth triumph in four years. 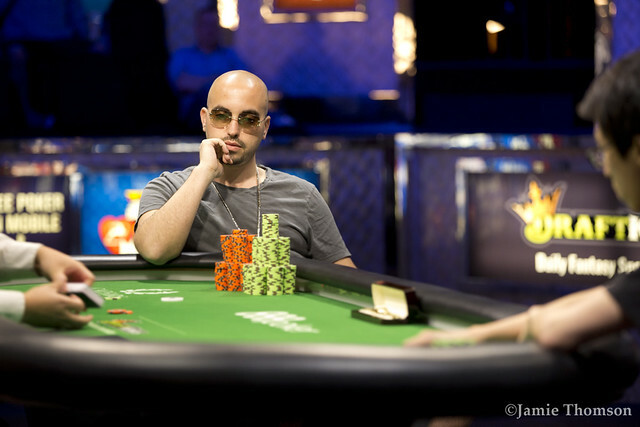 Also among the gauntlet of formidable challengers was Amir Lehavot (Tel Aviv, Israel), a former WSOP Main Event championship finalist and gold bracelet winner. Then, there was Bryn Kenney, who was aiming for his second win following his breakthrough victory at last year’s WSOP in the $1,500 buy-in Ten-Game Mix (Six-Handed) event. This finale seemed to belong to Kenney most of the way, at least until the final hour of competition when a stretch of three hands basically flip-flopped the outcome. Kenney, adorning is trademark designer sun shades and a steely glare under the spotlight, arrived as the final table’s second-biggest stack. However, he was the chip leader much of the night. In fact, Kenney seemed to get stronger as the final day grew longer, widening his advantage with each passing hour as his opponents were steadily being eliminated. Kenney seemed easily on his way to victory, but then lost the critical hands late which see-sawed the title over to Wang, who had been speechless and contemplative throughout, until the final hand when he finally revealed emotion and relief. 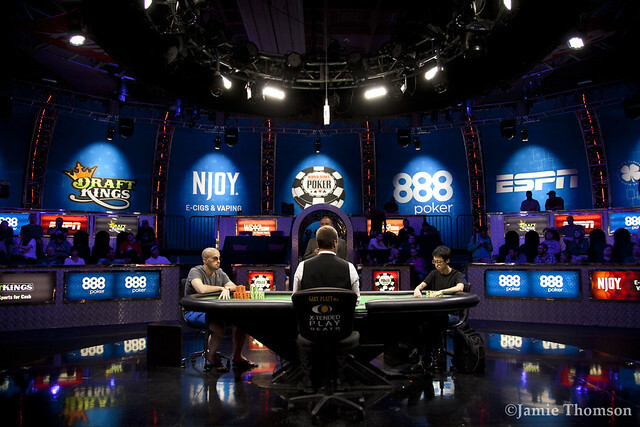 The final hand occurred when both players completed a flush on the turn, but Wang’s Jack-high hearts topped Kenney’s Nine-high. Wang moved all in on the river and after about a minute of thoughtful deliberation, Kenney announced a call, thus ending the night in spectacular, and unexpected fashion. Kenney, from Long Beach, NY finished as the runner up. 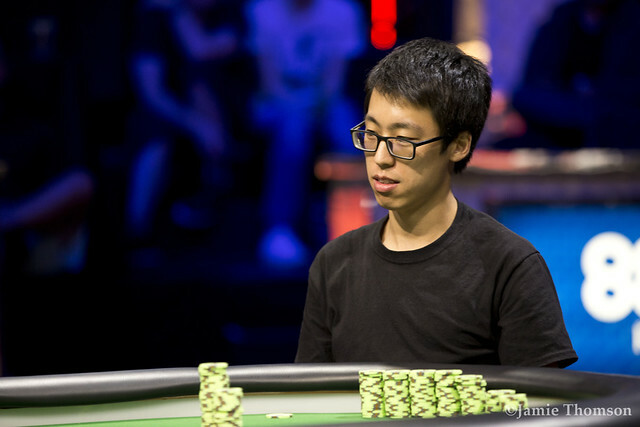 The 28-year-old poker pro collected a respectable consolation prize amount to $287,870, although he was clearly disappointed after losing a 9 to 1 chip advantage when heads up play began with Wang. Third place went to Arthur Koren, a 26-year-old student from Vienna, Austria. The payout totaled $208,177. Former world champion Greg Merson, now representing WSOP.com as an online player and ambassador finished in fourth place. He scooped another $152,126 from the series, moving to more than $10 million in career WSOP earnings. Fifth place belonged to Jason Wheeler, a Chicago-based poker pro. The winner of the World Poker Tour’s “High Roller” event in Amsterdam held just a few weeks ago, added $112,339 to his poker bankroll. Amir Lehavot, third in the 2013 Main Event championship, took sixth place. 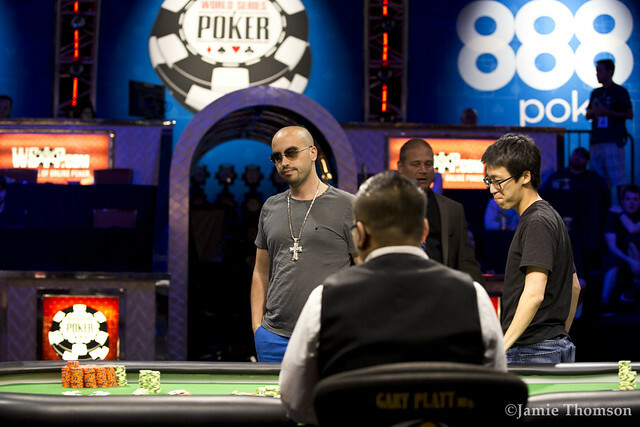 The poker pro originally from Israel earned $83,838, but missed the chance to add to his jewelry collection following his previous win in 2011. With this cash, he now has more than $4.6 million in career WSOP earnings. The seventh-place finisher was Joe Ebanks, from Kent, OH. That deep run paid $63,210. Eighth place went to Long Nguyen, a machinist from Houston. Nguyen picked up a nice check for $48,137. 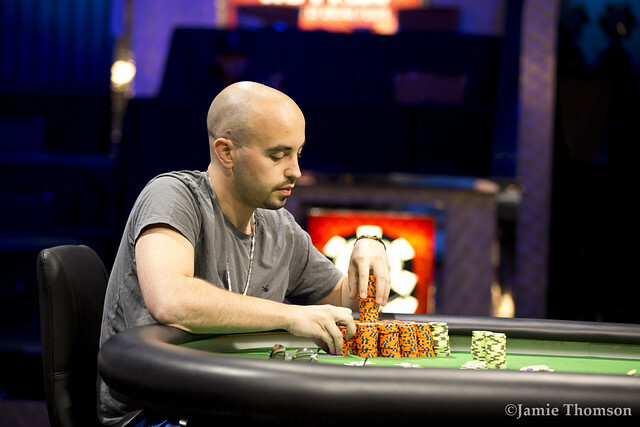 Rounding out the final table was Byron Kaverman, from Columbus, OH. Busting early from the finale still netted a nice score worth $37,030. The winner, Michael Wang, was born in New Orleans, LA. He is a graduate of Lehigh University in Pennsylvania with a degree in biology. He has been playing poker off and on professionally for about six years. This was his biggest career win, by far. Before he can even begin to stack his recently won chips, Mike Wang raises to 150,000 from the button on Hand #167. Bryn Kenney calls. On a flop, Kenney checks, and Wang bets 150,000. Kenney check-raises to 415,000, and Wang calls. The turn is the . Kenney leads out with 765,000, and Wang calls. On the river, Kenney bets 1,645,000. After tanking for nearly a minute, Wang moves all in, putting Kenney to the test. Pondering the situation for a long while, Kenney squirms in his seat, then eventually tosses his sunglasses on the table and calls. Kenney shows down for a flush, but Wang has that beat. He turns over his , and the pot goes to the bigger flush. Bryn Kenney is out in second place, cashing for $287,870. 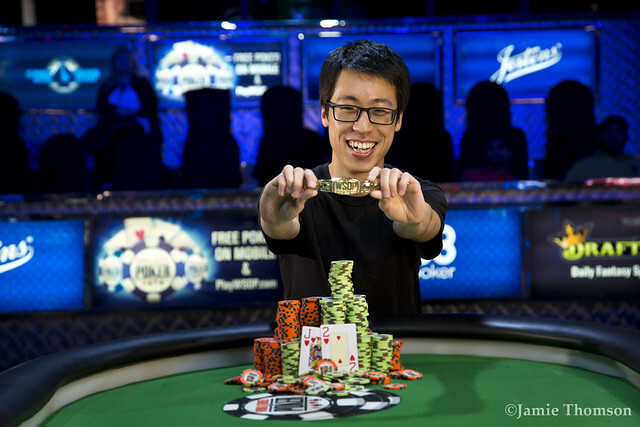 Mike Wang wins his first WSOP bracelet and $466,120. Bryn Kenney limps the button, and Mike Wang checks his option. The flop comes , and Kenney bets 90,000. Wang stacks out a check-raise and makes it 325,000 total. Kenney calls rather quickly. The turn is the , and Wang leads back out with a bet of 525,000. Kenney calls with the same relative urgency as before, and the river fills out the board. 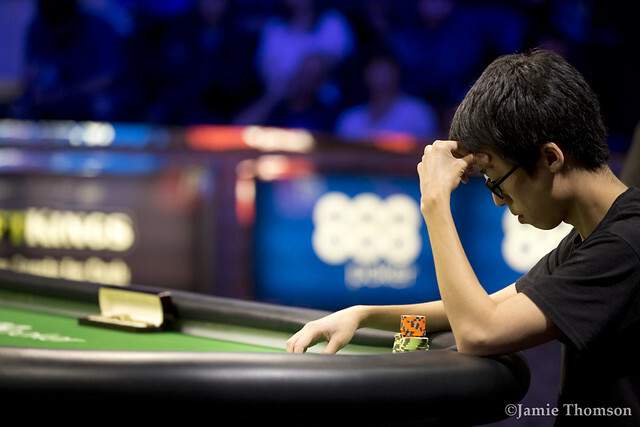 There is nearly 3.3 million in the pot now, and Wang has less than 2 million in front of him. He pauses to consider the situation, then makes a two-fisted bet in the neighborhood of 1.3 million. Kenney calls, and Wang tables , the straight to the jack and the nuts. 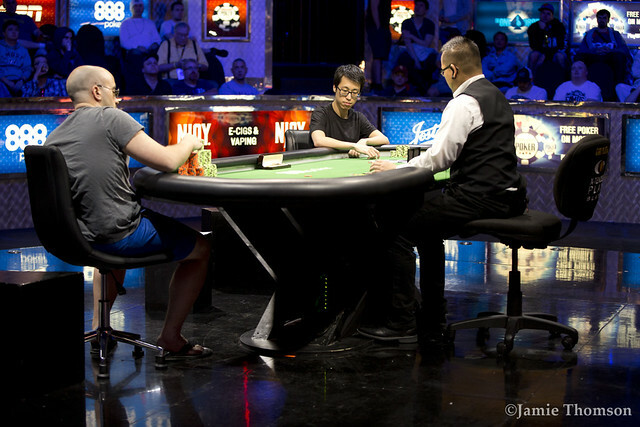 Kenney scowls and mucks, and Wang has taken a sizable chip lead with that monster pot. Mike Wang raises to 150,000 from the button. Bryn Kenney calls. On the flop, both players check. The turn is the , and Kenney checks. Wang bets 125,000, and Kenney check-raises to 410,000. Wang calls. Kenney bets 1,095,000 on the river. Wang folds. On the button, Bryn Kenney bets 140,000. Mike Wang folds. Bryn Kenney gets a walk. Bryn Kenney raises to 140,000 from the button. Mike Wang folds. Mike Wang gets a walk. Mike Wang raises 150,000 from the button. Bryn Kenney reraises to 420,000, and Wang folds. On the button, Bryn Kenney opens to 140,000. Mike Wang folds. Mike Wang opens to 150,000 from the button, and Bryn Kenney calls. The flop is , and Kenney check-calls a Wang continuation bet. They both check through the turn, and the last card off the deck is the . Kenney checks for a third time, and Wang puts out a river bet of 425,000. Kenney spends a few seconds staring across the table, then begins stacking out chips. He settles on a check-raise to 1,320,000, sliding it out into the middle of the table with two hands. Wang calls after just a few seconds. Kenney shows for ace-high, and Wang's wins him that big pot. On the button, Bryn Kenney raises to 135,000, and Mike Wang folds. Bryn Kenney opens to 135,000 from the button, and Mike Wang calls. The flop comes , and Kenney continues out for 170,000. Wang check-raises to 450,000. Kenney calls without too much hesitation, and the turn brings the . Wang leads for 625,000, and Kenney calls again after just a few seconds. The river fills out the board, and both players check. Wang tables for the airball, and Kenney waits to see it before showing down the winning . His two pair are plenty good, and he's beginning to stretch that lead back out after the gap was nearly closed. Bryn Kenney opens to 135,000 from the button, and Mike Wang folds. On the button, Mike Wang opens for 120,000. Bryn Kenney folds.